Another major contribution for Bicol University’s growth was once again given by the BU College of Business, Economics and Management (CBEM) as four of the college’s degree programs successfully passed their recently concluded Accrediting Agency of Chartered Colleges and Universities in the Philippines (AACCUP) Accreditation Survey Visit (Level 3 Phase 2). 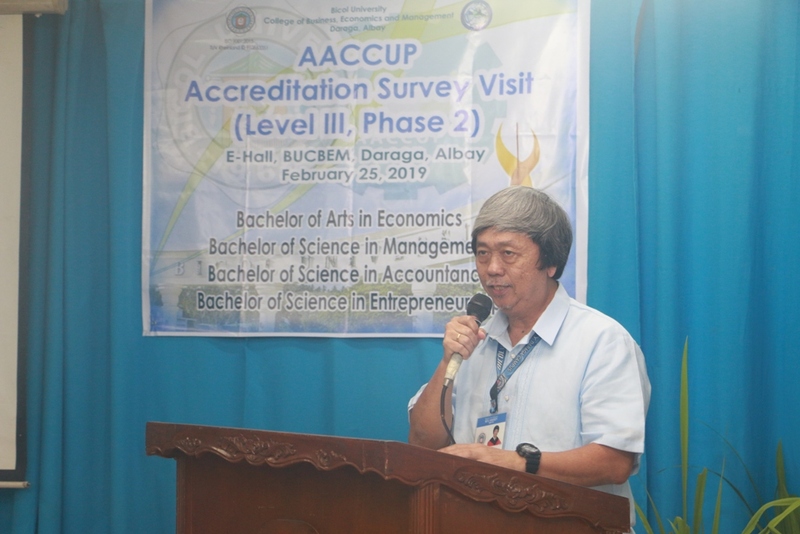 During the exit program for the said survey visit, held at the BU-CBEM’s Entrepreneurship Hall in the BU Daraga Campus last 25 February 2019, the AACCUP Survey Team announced the attainment of Level 3 accreditation for the Bachelor of Arts in Economics, Bachelor of Science in Management, Bachelor of Science in Accountancy, and Bachelor of Science in Entrepreneurship programs. The said AACCUP Accreditation Survey Visit is the second phase of CBEM’s third survey (for Level 3). 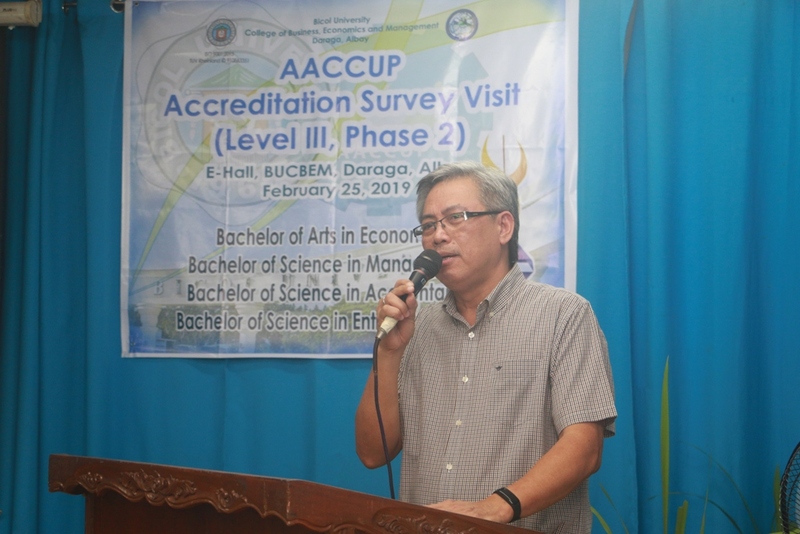 Each academic program under review was assigned a survey team, under the guidance of AACCUP Coordinator Dr. Manuel T. Corpus. The team assigned for the Bachelor of Arts in Economics program was led by Dr. Manolito C. Manuel of Pangasinan State University (PngSU), and is composed of Dr. Narciso F. Castro of PangSU and Dr. Manuel T. Corpus of AACCUP. 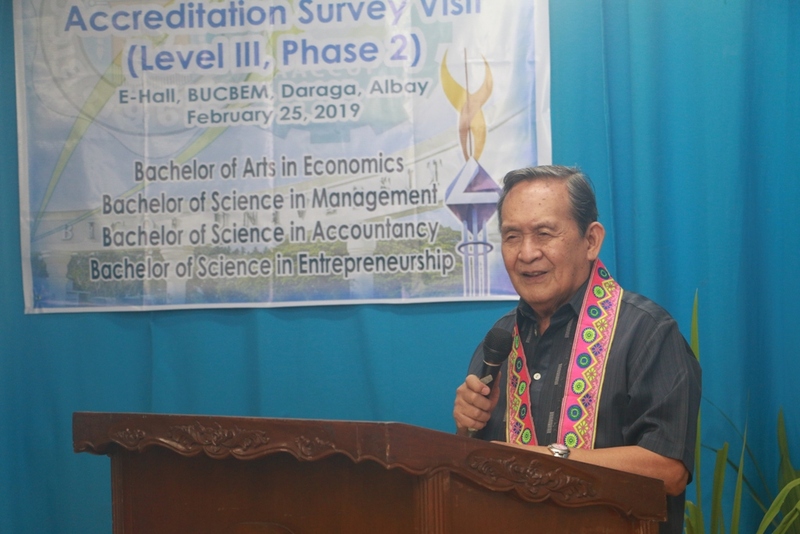 The same three accreditors also reviewed the Bachelor of Science in Accountancy, but it was Dr. Castro who took the lead for the said program. For the Bachelor of Science in Management program, the survey team in composed of Dr. Jennifer G. Fronda of Nueva Ecija University of Science and Technology (NEUST), Dr. Maria Glenda O. Delara of Philippine Normal University, Dr. Manuel T. Corpus of AACCUP, and Team Lead Dr. Cristina R. Bundoc of the University of Northern Philippines (UNP). The same set of accreditors were also assigned for the Bachelor of Science in Entrepreneurship program, but the team was led by Dr. Fronda. After hours of meticulous review, the survey visit concluded with the brief program. 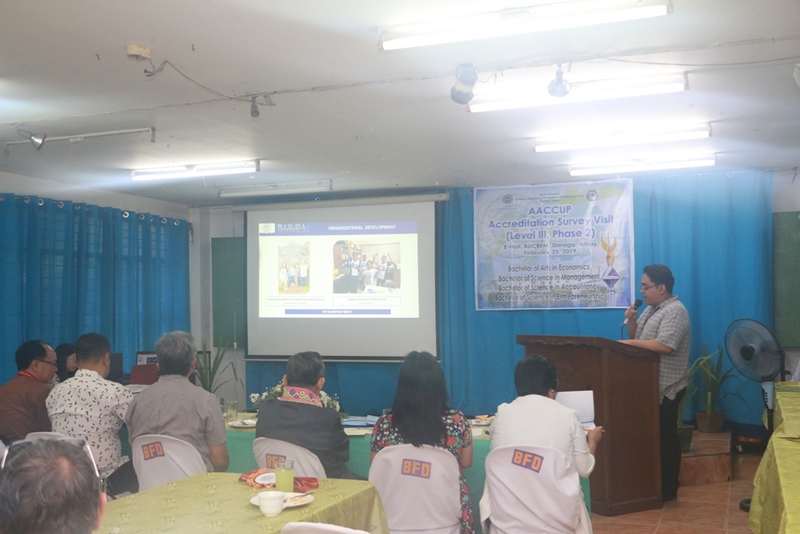 The program started BU President Dr. Arnulfo M. Mascariñas expressing his deep gratitude to the AACCUP Accreditors’ visit during his opening message. 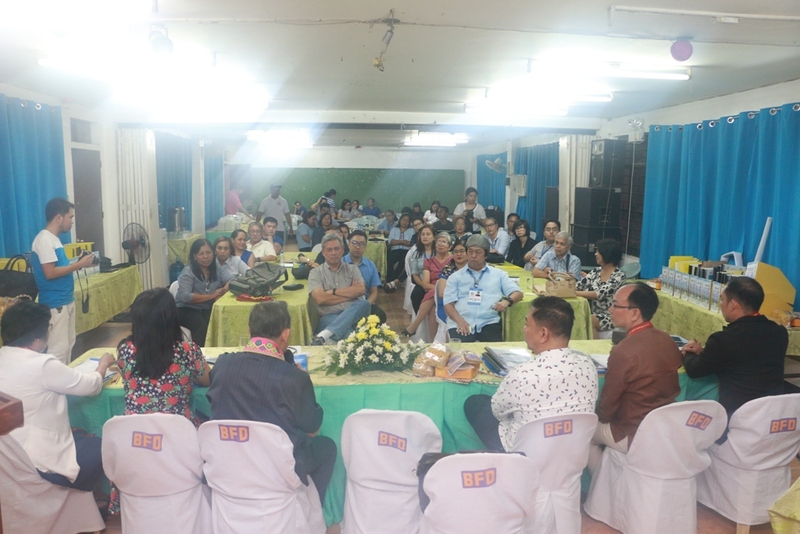 Afterwards, Dr. Helen M. Llenaresas, BU’s Vice President for Academic Affairs (VPAA), introduced the Panel of Accreditors, who then proceeded with the seminar. 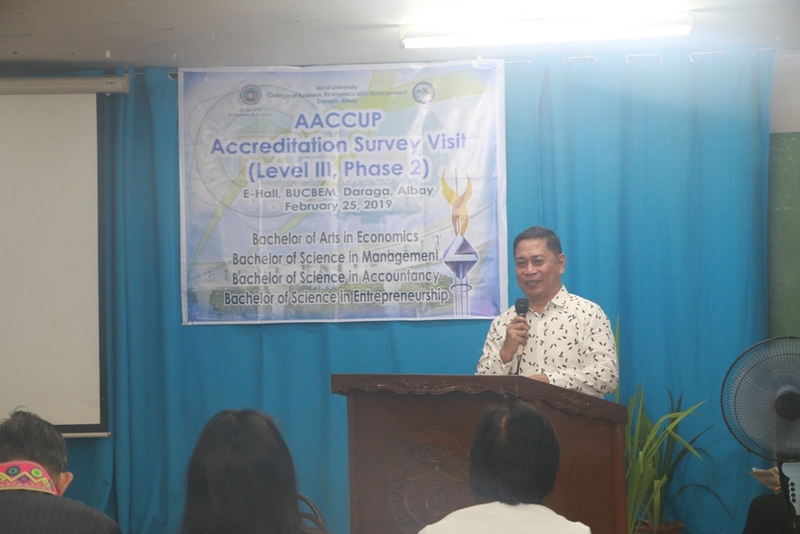 During the seminar, AACCUP Coordinator and Executive Director Dr. Manuel T. Corpus gave the ‘Statement of Purpose and Procedures’ of the survey visit. This was followed by the presentations of the narrative profiles of BU-CBEM and the four programs under review. BU-CBEM Dean Dr. Eddie S. See took the lead and presented the narrative profile of CBEM. He was followed respectively by Accountancy Department Chairperson Prof. Mark Francis G. Ng, Business Administration Department Chairperson Prof. Joy C. Lawenko, and Economics Department Chairperson Dr. Ricardo M. Belgica. After the profile presentations, the panel of accreditors and the participants had a brief discussion of the survey findings, which was followed by a meeting among the accreditors. After much anticipation, AACCUP’s Dr. Manuel T. Corpus announced the result of the survey. CBEM’s academic programs have passed Level 3 AACCUP accreditation. Showing their gratefulness for the visitors, the accreditors were given Certificates of Appreciation in a brief ceremony headed by BU President Dr. Arnulfo M. Mascariñas, VPAA Dr. Helen M. Llenaresas, BU Vice President for Administration and Finance (VPAF) Dr. Amelia A. Dorosan, and BU-CBEM Dean Dr. Eddie S. See. 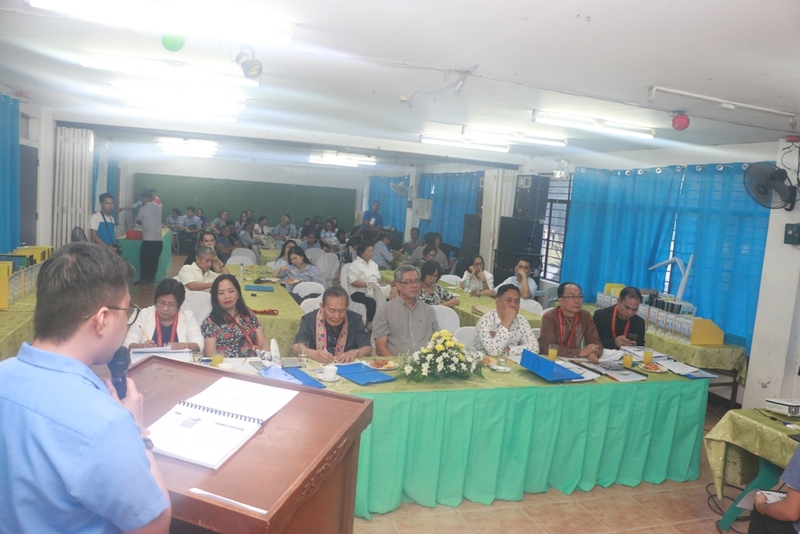 The exit conference concluded with VPAF Dr. Amelia A. Dorosan imparting her words of gratitude to the accreditors and the BUCBEM personnel for their diligence that resulted to the said achievement.